Just announced at Comic Con in San Diego: Orson Scott Card and I will be writing a new limited series for Marvel in the Enderverse entitled FORMIC WARS. Check out an interview I did for Marvel.com here. As any fan of Ender’s Game knows, Ender Wiggin destroyed the Formics in the Third Formic War. But what about the First and Second Formic Wars? What happened during THOSE conflicts? How did the world get to the state it’s in when Ender is born? 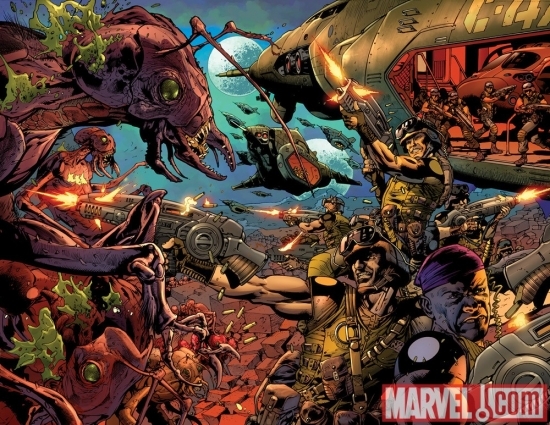 What did the formics do to our planet that led to all-out war? Well, the answers will come in this new limited series, including the story of young Mazer Rackham. I can’t tell you how thrilled I am to be working on this. I’ve been a life-long fan of Ender’s Game, and to work in the Ender universe now is absolutely incredible. I still can’t believe it myself. Look for more news about the upcoming series in the future.